Although the order did not refer specifically to people of Japanese ancestry, it set the stage for the internment of people of Japanese descent. In March 1942, Lieutenant General John L. DeWitt, head of the Western Defense Command and Fourth Army, issued the first of 108 military proclamations that resulted in the forced relocation from their residences to guarded relocation camps of more than 110,000 people of Japanese ancestry on the West Coast. In Hawai’i, martial law, complete with curfews and blackouts, was imposed. A large portion of the population was of Japanese descent (150,000 out of 400,000 people in 1937) and internment was deemed not practical, mostly for economic reasons. If the government had interned the Japanese–Americans and immigrants in Hawai’i, the economy would not have survived. 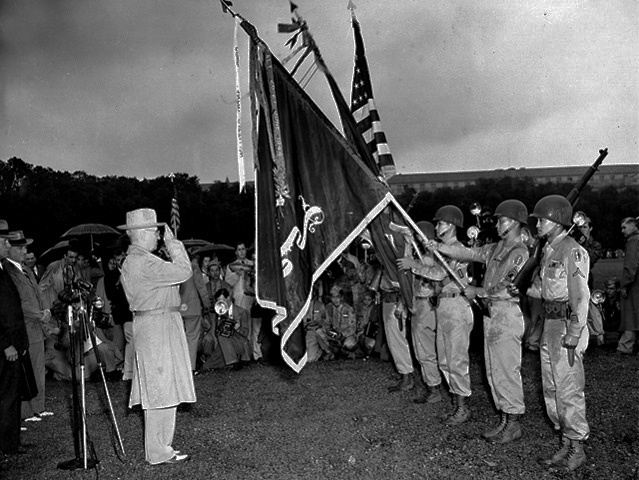 When the War Department called for the removal of all soldiers of Japanese ancestry from active service in early 1942, General Delos C. Emmons, commander of the U.S. Army in Hawaii, decided to discharge those in the Hawaii Territorial Guard, which was composed mainly of ROTC students from the University of Hawaii. But, he kept the more than 1,300 Japanese–American soldiers of the 298th and 299th Infantry regiments of the Hawaii National Guard. The discharged members of the Hawaii Territorial Guard petitioned General Emmons to allow them to assist in the war effort. The petition was granted and they formed a group called the Varsity Victory Volunteers, which performed various military construction jobs. General Emmons, worried about the loyalty of Japanese-American soldiers in the event of a Japanese invasion, recommended to the War Department that those in the 298th and 299th regiments be organized into a “Hawaiian Provisional Battalion” and sent to the mainland. The move was authorized, and on June 5, 1942, the Hawaiian Provisional Battalion set sail for training. They landed at Oakland, California on June 10, 1942 and two days later were sent to Camp McCoy, Wisconsin. On June 15, 1942, the battalion was designated the 100th Infantry Battalion (Separate)—the “One Puka Puka”. As they say, the rest is history. When the war was over and the dead were buried the following list of Medals had been awarded to these brave American Nisei: 21 Medals of Honor, 1 Distinguished Service Medal, 22 Legion of Merit Medals, 15 Soldier’s Medals, 4,000 Bronze Stars (plus 1,200 Oak Leaf Clusters for a second award; one Bronze Star was upgraded to a Medal of Honor in June 2000. One Bronze Star was upgraded to a Silver Star in September 2009, 9,486 Purple Hearts. On October 5, 2010, the Congressional Gold Medal was awarded to the 442nd Regimental Combat Team, the 100th Infantry Battalion, and Nisei serving in the Military Intelligence Service. There are far to many stories of the bravery and courage that these Nisei demonstrated to include them in this article but I would be remiss if I did not share at least one. 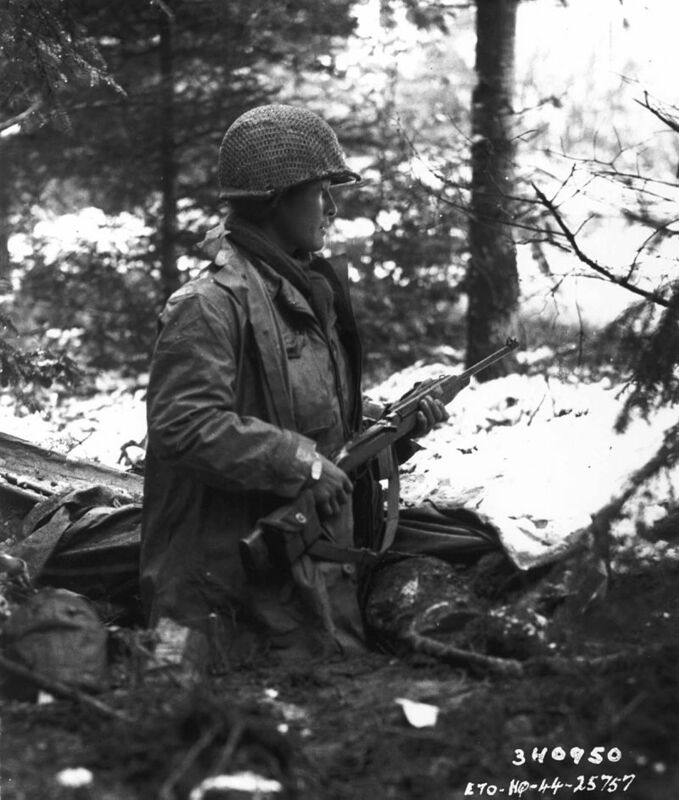 A 442nd RCT squad leader checks for German units in France in November 1944. 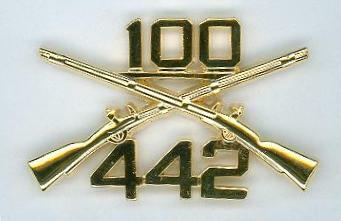 After less than two days in reserve, the 442nd was ordered to attempt the rescue of the “Lost Battalion” two miles east of Biffontain On October 23 Colonel Lundquist’s 141st Regiment, soon to be known as the “Alamo” Regiment, began its attack on the German line that ran from Rambervillers to Biffontaine. Tuesday morning, October 24, the left flank of the 141st, commanded by Technical Sergeant Charles H. Coolidge, ran into heavy action, fending off numerous German attacks throughout the days of October 25 and 26. The right flank command post was overrun and 275 men of Lieutenant Colonel William Bird’s 1st Battalion Companies A, B, C, and a platoon from Company D were cut off 1.2 miles behind enemy linesThe “Lost Battalion” was cut off by German troops and was forced to dig in until help arrived. It was nearly a week before they saw friendly faces. At 4 a.m. on Friday October 27, General John E. Dahlquist ordered the 442nd to move out and rescue the cut-off battalion. 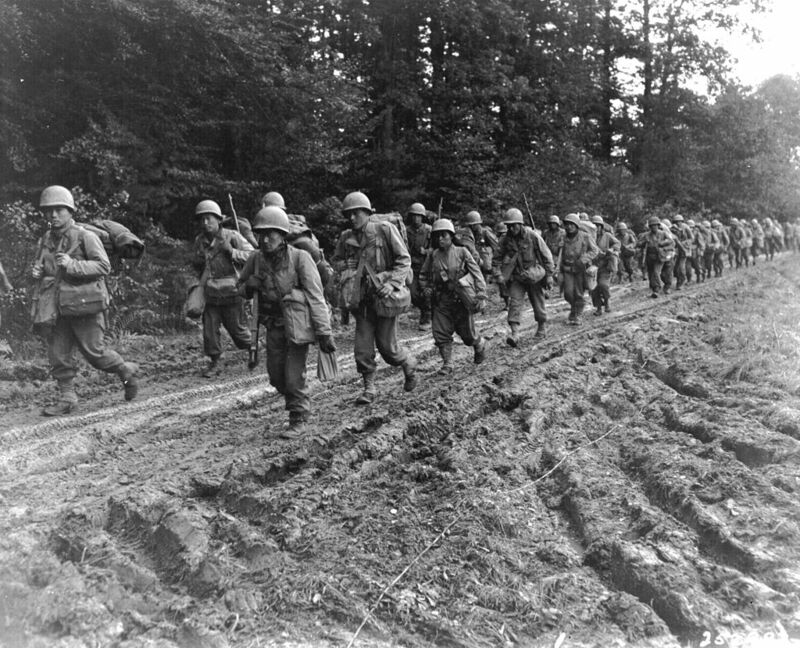 The 442nd had the support of the 522nd and 133rd Field Artillery units but at first made little headway against German General Richter’s infantry and artillery front line For the next few days the 442nd engaged in the heaviest fighting it had seen in the war, as the elements combined with the Germans, to slow their advance. Dense fog and very dark nights prevented the men from seeing even twenty feet. Many men had to hang on to the man in front of him just to know where to go. Rainfall, snow, cold, mud, fatigue, trench foot, and even exploding trees plagued them as they moved deeper into the Vosges and closer to the German frontlines. The 141st continued fighting—in all directions. “When we realized we were cut off, we dug a circle at the top of the ridge. I had two heavy, water-cooled machine guns with us at this time, and about nine or ten men to handle them. I put one gun on the right front with about half of my men, and the other gun to the left. We cut down small trees to cover our holes and then piled as much dirt on top as we could. We were real low on supplies, so we pooled all of our food.” SSgt. Jack Wilson of Newburgh, Indiana. Airdrops with ammo and food for the 141st were called off by dense fog or landed in German hands. Many Germans didn’t know that they had cut off an American unit. “We didn’t know that we had surrounded the Americans until they were being supplied by air. One of the supply containers, dropped by parachute, landed near us. The packages were divided up amongst us Only on October 29 was the 442nd told why they were being forced to attack the German front lines so intensely. The fighting was intense for the Germans as well. Gebirgsjager Battalion 202 from Salzburg was cut off from Gebirgsjager Battalion 201 from Garmisch Both sides eventually rescued their cut-off battalions. As the men of the 442nd went deeper and deeper they became more hesitant, until reaching the point came that they would not move from behind a tree or come out of a foxhole. However, this all changed in an instant. The men of Companies I and K of 3rd Battalion had their backs against the wall, but as each one saw another rise to attack, then another also rose. Then every Nisei charged the Germans screaming, and many screaming “Banzai!” Through gunfire, artillery shells, and fragments from trees, and Nisei going down one after another, they charged. Colonel Rolin’s grenadiers put up a desperate fight, but nothing could stop the Nisei rushing up the steep slopes, shouting, firing from the hip, and lobbing hand grenades into dugouts. Finally the German defenses broke and the surviving grenadiers fled in disarray. That afternoon the American aid stations were crowded with casualties. The 2nd platoon of Company I had only two men left, and the 1st platoon was down to twenty.” On the afternoon of October 30, 3rd Battalion broke through and reached the 141st, rescuing 211 T-Patchers at the cost of 800 men in 5 days. However, the fighting continued for the 442nd as they moved past the 141st. The drive continued until they reached Saint-Die on November 17 when they were finally pulled back. The 100th fielded 1,432 men a year earlier, but was now down to 239 infantrymen and 21 officers. 2nd Battalion was down to 316 riflemen and 17 officers, while not a single company in 3rd Battalion had over 100 riflemen; the entire 100th/442nd Regimental Combat Team was down to less than 800 soldiers. On October 13, 1944 when attached to the 36th Infantry, the unit was at 2,943 rifleman and officers, but in only three weeks 140 were killed and 1,800 were wounded, while 43 were missing. General Dahlquist’s actions and orders received mixed reviews. 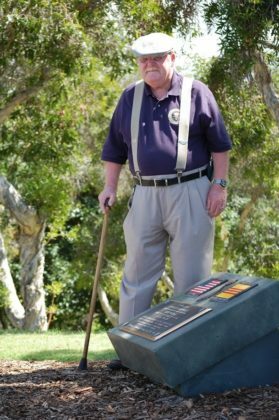 Many Nisei veterans disliked or disrespected General Dahlquist believing that Dahlquist only saw the Nisei as cannon fodder, or expendable soldiers. Although they respected his courage, seeing him stand in the open issuing orders while a battle ensued, even though his aide Lieutenant Lewis—the eldest son of Nobelist Sinclair Lewis—was killed, his command ability was questioned. 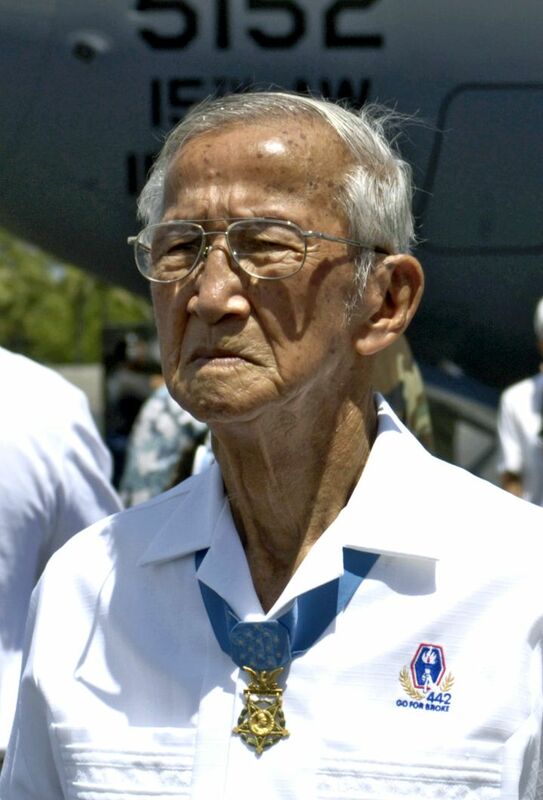 Lt. Allan Ohata was ordered to send his men straight up the hill, but refused to send his men into a suicide charge. Dahlquist demanded compliance but Ohata risked loss of rank and decorations and court-martial, insisting on attacking “their way Dahlquist’s order to take Biffontaine was also questioned, because it was a farming town with only a few hundred inhabitants, was out of reach of artillery protection, and outside radio contact with command. Many years later Lieutenant Colonel Gordon Singles, a white officer and former commander of the 442nd, ran into General Dahlquist. Colonel Singles was filling the role of Brigadier General at Fort Bragg (North Carolina), when General Dahlquist arrived as part of a review. When General Dahlquist recognized Colonel Singles he offered the Colonel his hand and said, “Let bygones be bygones. It’s all water under the bridge, isn’t it?” Colonel Singles, in the full presence of the entire III Corps, continued to salute General Dahlquist (as military protocol dictated) but refused to shake Dahlquist’s hand. On June 21, 2000 President Clinton awarded 22 Medals of Honor as a result of as a result of Silver Stars being upgraded. My job at the National Memorial Cemetery gave me the honor of accompanying many of these Nisei hero’s to their final resting place. Should your travels bring you to this National Shrine I am sure the staff would be happy to direct you to the resting places of these brave and honorable Americans.